1. Dice your apples, add to a large mixing bowl. Add in the lemon juice. 2. Peel and slice up your orange. Add orange and a bit of grated orange zest (optional) to the bowl. 3. Add in the raisins, cinnamon, maple syrup and walnuts. Toss everything very well. 4. Add in the flax oil one teaspoon at a time - tossing AND tasting after each addition. 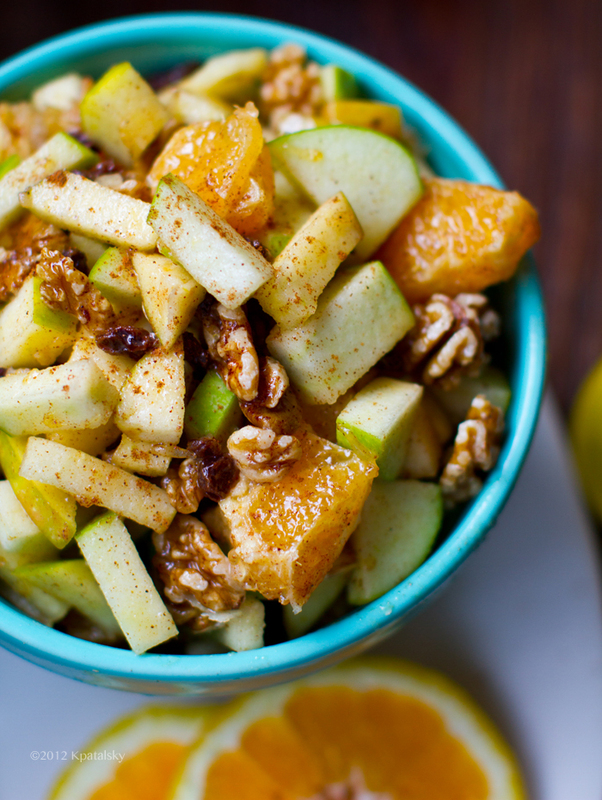 You do not want to overwhelm the fruit with flax, so taste as your go. I like a nice amount of oil, but you may be more sensitive to the flavor. 5. Chill and serve. Tip: for quicker serving, make sure your fruit is chilled before making salad. Then you can serve right away.